Over the past 20 years, the Sandy Springs community has become an ethnically diverse hub of commerce and culture. The city’s proximity to corporate offices and affordable housing attract residents from all over the world. Unfortunately, many area churches have remained predominantly homogeneous. And for the longest time, North Springs United Methodist Church was no exception. In the church’s heyday, the parish expanded, adding a needed Sanctuary and basement youth facility. However, in subsequent years, the church population slowly declined due to death and members moving away. Although the city surrounding the church was growing in population, the church itself was not attracting new people and funds were depleting. It has always been a warm and welcoming congregation, and determined church leadership was not giving up without a fight! 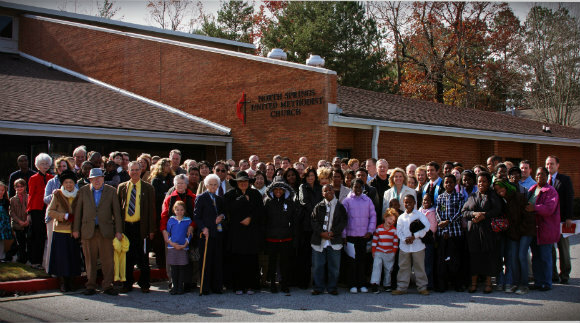 With the help of the North Georgia Conference “Next Faithful Step” revitalization program, North Springs UMC determined its purpose and plan to move forward in faith. After a few international families started attending regularly due to a family-friendly atmosphere and close proximity to their homes, the church came to understand that God was calling them to widen their circle. Who is included in God’s family? Everyone! No matter what color, ethnicity, gender, disability, addiction, or economic status. Our mission is to make disciples together; different people, from different places being church and reflecting the peace of Christ to all. We began to connect with community outreach mission programs and festivals in order to share our vision. We opened our doors to the Communitas Brazilian United Methodist Fellowship, and to a small Hispanic Church needing a place to worship. We shifted our worship style to include global music along with traditional hymns and some contemporary songs. As a result of this work, we now have more than 22 countries represented in our congregation, and have been designated an official “Mission Church” in the Atlanta-Roswell District of the North Georgia Conference. In this growing period, we have persevered even though our budget was projected to mainline in the spring. With a faith-based budget, God provides. We did not sacrifice mission work in order to pay utilities bills! Thank you to the Georgia United Methodist Foundation, Congregational Excellence, our District and all who support our work so we can carry on the Great Commission found in the Gospel of St. Matthew, to “go and make disciples of all nations,” right at our doorstep. In July 2018, North Springs UMC refinanced their loan with the Georgia United Methodist Foundation. This article was published in the 10/29/18 edition of re-Vision, a weekly e-newsletter published by The North Georgia Conference of The United Methodist Church.